Free Moist Repair Mini Duo! with a £40 Spend on KMS! Stock Up on KMS Today! KMS Packs have been put together by Gorgeous Shop. containing products that work together to give real results. Tailored to your hair type. The packs also offers exceptional value for money! Start caring for your locks with these products which will improve each hair strand inside and out. Style products individually formulated to ensure the style you want is easily created. With up to 3 days hold and humidity protection, provide a long-lasting style for your locks. 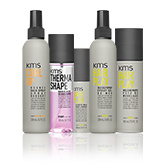 KMS Salon Sizes are all your favourite products in 750ml Salon Sizes. They last far far longer than their retail counterparts, also the benefit of purchasing these larger sizes are that you receive fantastic value for money! So whether you're ColorVitality, MoistRepair, FlatOut, SilkSheen, AddVolume or HeadRemedy you can find your shampoos and conditioners here. Repair and moisturise dry, damaged or brittle hair leaving it repaired and gorgeously healthy. Hydrate your luscious locks with products like KMS MoistRepair Pack. Add incredible volume, body and bounce to fine or thinning hair. The nutritious, body building range builds strength and fullness into hair leaving it lusciously thick and voluminous. Formerly Amp Volume. Keep your hair full of vitality with KMS AddVolume Root & Body Lift, your answer to gorgeous hair! Colour will be locked and sealed with this incredible range, leaving hair healthy and vibrant. 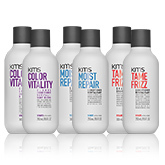 KMS TameFrizz range softens and smoothes frizzy, rebellious hair. Headremedy provides solutions for specific scalp or hair problems such as dandruff or sensitivity. Maintain gorgeously smooth and healthy hair with products like KMS HeadRemedy Pack. Really have fun with your hair and play with these super styling products. Offering flexible hold, texture and mouldability for all hair types. 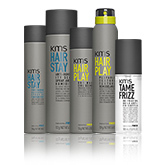 KMS hair products are Ideal for fun, creative styling. KMS HairPlay Pack is the perfect pack of products for creating playful hair styles. Supreme hold for supreme style. The Hairstay range provides soft to firm hold and control. ThermShape has been formulated to prep and prime hair before heat styling! The entire range from shampoos to blow-dry sprays, the ThermaShape range improves manageability to give you a long-lasting smooth and flexible hair style! Curly/wavy hair needs a little more attention and moisture than hair that is naturally straight. KMS and Gorgeous Shop offer this Curlup range which provides intense hydration, control, definition, separation and enhancement. Keep hair gorgeously silky, defined curls with products such as KMS CurlUp Pack. 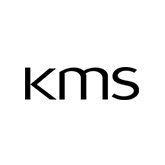 View all KMS Hair products in one place. Not sure what you are looking for? Simply select your hair requirement and product type. Founded in 1976, with their first product being the NEFA (Natural Essential Fatty Acids) Shampoo. 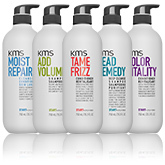 After launching their brand with the KMS California shampoo a new styling and setting gel was introduced, and innovation thermal styling protect launched six years later. 1985 saw the release of one of the first leave-ins, a conditioner which provided a detangling and moisture which soon became of the companies greatly successful products. In 1992 the first KMS California reconstructor was introduced – a product which adds pliability and shine to damaged, brittle and splitting hair. See how MoistRepair can lend a helping hand in remedying dry hair back to health. See Simon Miller, KMS Global Style Council in action. Get that extra 10 minutes in the morning with Quick Blow Dry. 1995 and 1996 were the years of two game changing products being introduced. FLATOUT – a non-chemical relaxer which evolved into their product of today THERMASHAPE straightening crème which provides easy smoothing and straightening whilst protecting the hair from heat. HAIRPLAY was also introduced – a moulding clay still loved by professionals today. The iconic mattifying product was born – HAIRPLAY Dry Wax was developed produce a matte finish and has been a best-seller ever since. Over the next ten years KMS California Hair Products continued to launch a number of innovative products benefitting men and women all over the world. In 2016 KMS celebrated 40 years of innovation. KMS believe in using START. STYLE. FINISH. START – products include the AHA structure complex, which primes the hair by improving the inside as well as the outside of the hair. This means that STYLE products are able to adhere evenly. STYLE – containing innovative shaping blends means each products allows you to create the style you want. FINISH – formulated with flexible sealing compounds they help to prolong the effects of style products holding for up to 3 days.